Bradford Ellis, Executive Director of Vernon Homes, was awarded the 2016 Eli Pick Facility Leadership Award by the American College of Heath Care Administrators. This is the second year in a row that he has received the award for his leadership of Vernon Homes’ nursing facility Vernon Green. The award recognizes administrators whose teams have achieved a level of organizational quality that few others have been able to reach. Ellis was one of only 280 nursing home administrators nationwide who received the award and one of just 247 recipients whose award included virtual recognition, meaning that he provided leadership throughout the entire award year. The ACHCA believes that nursing home excellence is a reflection of leadership excellence, and selects winners based on: high scores on three years of skilled nursing facility survey data, including health, fire and complaint surveys; top-quartile performance on designated quality measures; 80% or greater facility occupancy; and zero citations for “Special Focus Facility” status (a government term applied to under-performing care facilities). In July 2015 Vernon Green was awarded the Nursing Home Quality Award from Vermont's Department of Disabilities, Aging and Independent Living. 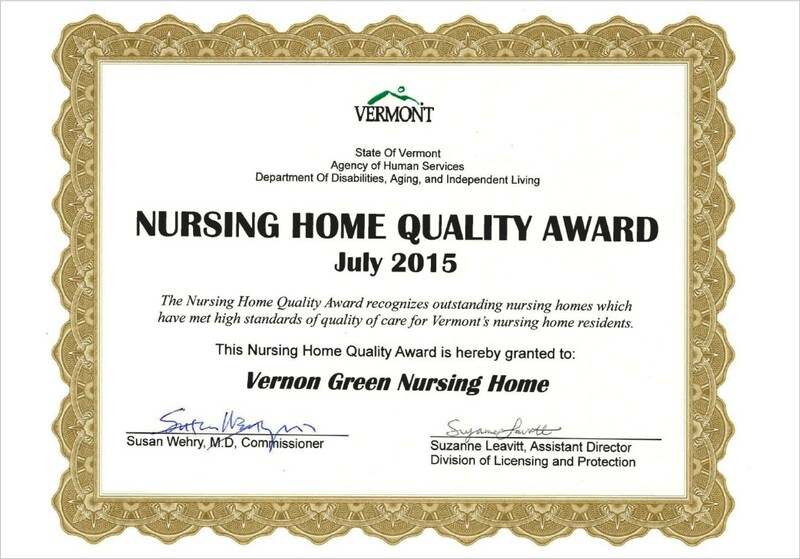 We were one of five out of Vermont's 37 nursing homes to earn this prestigious award. Thanks to the entire team at Vernon Green! Voted the Best of the Best - again! 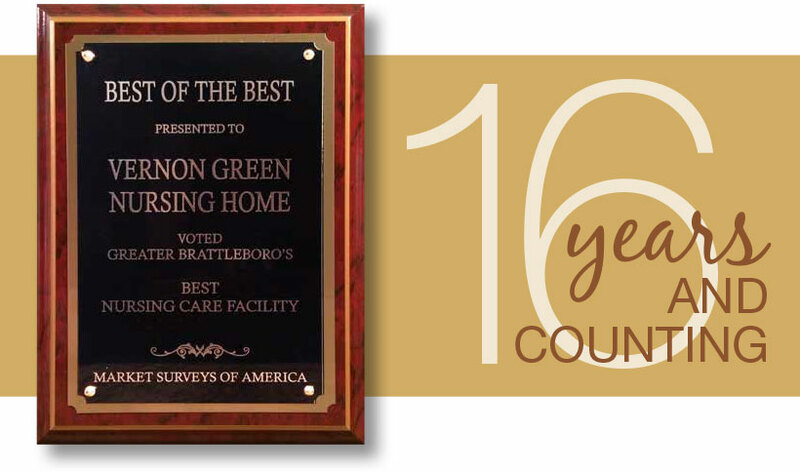 Vernon Green Nursing Home received another Best of the Best Award as Vermont's top nursing home. That makes 16 years in a row! 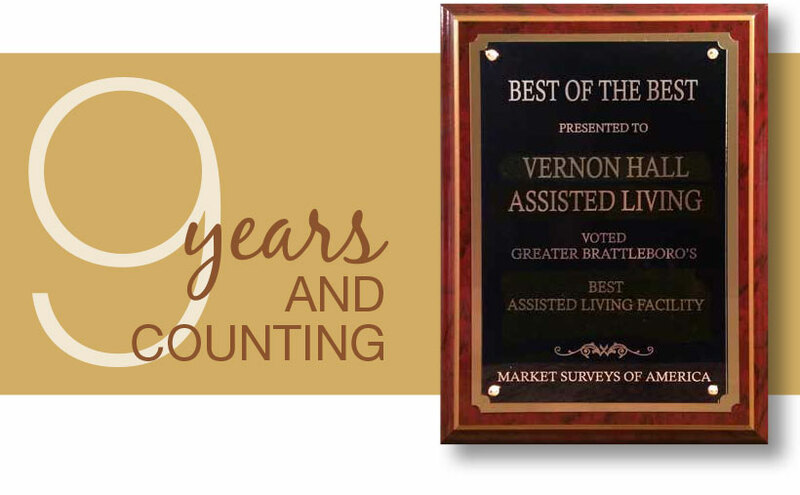 And Vernon Hall received its eighth straight Best of the Best in the assisted living category. Thanks to each VACH team member who made this double string of success possible! Our Profiles in Grace video series, which profiles the lives of 13 ACRC residents in 11 videos concludes with the summary video below. If you've seen the individual videos, this one "puts a wrap" on the production. If you haven't, it serves as an introduction. We invite you to watch each one - again, or for the first time. Watch them all on our YouTube channel or Facebook page. Learn the essential facts you should know in the free DVD: 10 Things to Know When Selecting a Physical Rehabilitation Facility. Request your copy: info@vernonhome.org. Vernon Green Nursing Home received the 2013 Excellence in Action Award from National Research Corporation (NRC) in the Customer Category. The award recognizes skilled nursing homes, assisted living and independent senior living communities that achieve outstanding resident satisfaction. NRC monitors comments that senior communities receive regarding service, performance and overall satisfaction. We won for the positive feedback we received from our residents and their families. Only 395 skilled nursing, assisted living, and independent living organizations around the nation earned this award for 2013, placing us in the country's top 10 percent for resident satisfaction.